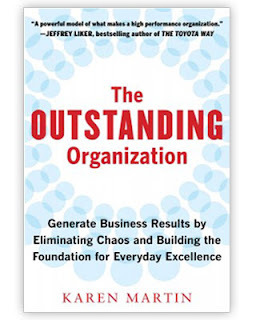 Karen Martin kindly sent me a copy of her new book, The Outstanding Organization: Generate business results by eliminating chaos and building the foundation for everyday excellence. We stayed in touch during the time she was writing the book, and I participated in some of her webinars, so I was pretty sure that it would be good. I was not disappointed. If they would admit it, leaders in many companies seeking lean as a business system are not close to where they want to be. People are still fighting fires, missing targets, producing defects, and dealing with weak buy-in at all levels. Karen Martin says one reason is that they did not take time to build a strong foundation for their lean structure. She identifies what the chaotic company usually lacks, how to recognize what's missing, and what to do about it. She gives good examples based on her experience and research. In addition to her own knowledge, Karen polled scores of experts and talked to many thought leaders to test her thinking, strengthening the value of the book. Lack of clarity: People draw different conclusions about what they and their business units are supposed to be doing and what the company wants to accomplish, what their customer wants. Therefore, there are arguments, unnecessarily long meetings, and rework. It’s frustrating to work under these conditions and takes a toll on people as well as the business. Lack of focus: Leaders change priorities almost randomly, try to solve too many problems at the same time, and fail to think through what they are trying to do to improve. Lack of discipline: Improvement programs often have weak commitment and are expected to produce too much too soon. There isn’t time for training and experience to make people proficient. I call this the failure to “pick something and do it” syndrome. Leadership waffles about what to fix and wastes time deciding. Almost anything will start to create the thinking that the company wants to leverage more widely. Too trivial or too knotty a problem will make progress difficult, but it shouldn’t be too difficult to pick a problem, like late deliveries to customers, that is visible to everyone. As long as everyone understands that working on that problem is like picking up a messy piece of string -- one knot will lead to finding another that is connected. That’s OK, as long as everyone knows it takes some time to make the whole tangle visible and surface many interrelated problems. Then, as Karen says, they need to have the discipline to stick with the improvement method of choice and work through more problems without becoming discouraged. Lack of engagement: This is the problem that everyone seems to be talking about these days. Having an engaged workforce and leadership seems important, but how do you change hearts and minds? Karen says that working on the first three problems will begin to produce that engagement the company is looking for. Quick read or deep study? The book is easy to read quickly -- nearly anyone can do that, even in the midst of chaos, and get something out of it. But ideally, the reader will take time to absorb each section carefully and reflect on how it relates to his or her organization. Because of its simplicity, it would be a good book for a leadership study group. Together they can read about and discuss chaos in their organization, and look at the state of the foundation they have tried to build in their effort to achieve transformative business results. Each of the four “lacks” would make a good topic of a separate meeting. Because Karen provides a good introduction to hoshin planning, the team would better see how to cascade goals and plans for both business results and continuous improvement, while filling in what their organizations lacks. As an overall summary of business problems and solutions, the book can only be a starting point, which I believe Karen recognizes. I don’t know when I’ve seen an author refer to as many books by prominent lean experts as intelligently as Karen has. In the process of writing, she talked to many of them, which assures us that she really knows what they are saying. If you wanted to learn the most about lean, you’d read each of the books she cites. I would have liked to see more diagrams and sample work documents, especially since Karen gives significant time to visual management. While producing and placing illustrations in a book adds to development lead time and expense, it would reinforce the text and especially help the person whose primary learning method is visual. I must say that I found a certain elegance to Karen’s writing. Not the type of elegance with frills and decoration, but a subtle touch with words and style that lets knowledge and ideas shine through. Overall, I give the book high marks and think it would be especially helpful for business leaders outside our bubble of lean aficionados. You can get more information about the book and Karen Martin's work at www.ksmartin.com. You can also find her on Twitter (@karenmartinOPEX) and on LinkedIn.